Wrist-deep in herbs, vodka and oil. Last Saturday I participated in an all-day herbology class taught by Sam Coffman of The Human Path in which we made herbal salves that would be appropriate for an herbal first-aid kit. Salves are preparations of natural oils and beeswax with the addition of the constituent compounds found in various healing herbs. They are designed to be used externally to assist the body with the natural healing process. 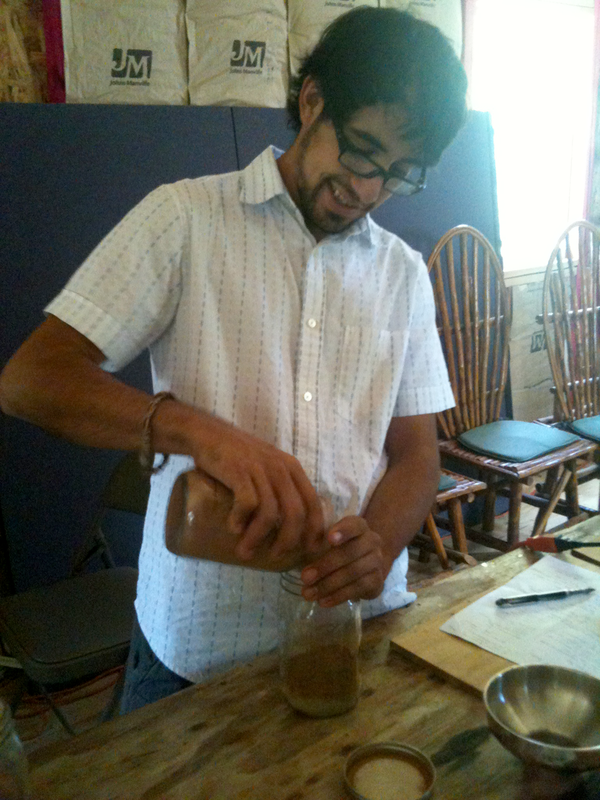 In our class we made two salves from start to finish: a bruise/sprain salve, and a wound/abrasion salve. Both have the same basic components in the base, and both are intended to heal injuries, but because the nature of these injuries are different, the herbs in the salves vary. Both salves were made with olive oil, beeswax, vitamin E oil and Grapefruit seed extract (the latter 2 ingredients serve as preservatives). For each salve, we collected the herbs and, if not already in powder form, ground them to a powder with a coffee grinder. We mixed them together largely in equal parts, with about 2x more arnica than the others in the bruise/sprain salve, and less than a full part of comfrey, myrrh in the wound salve. From there we poured the mix into a large stainless steel bowl (glass would also have worked, but do not use plastic or aluminum) and poured just enough alcohol over the herbs to completely cover them (in our case, a cheap vodka, though any similar alcohol will do). This mixture then sat for a couple of hours. We then added olive oil in a 2:1 ratio to this “menstruum” of herbs and vodka, and mixed well; we started doing this in a blender but the blender died, so we had to continue by hand. From there, we added the menstruum and oil mix to a crock pot and heated until the mixture came to a boil. This process is to remove the alcohol and any water in the mixture. When it seemed that a lot of the alcohol had evaporated, we poured the mixture into a strainer lined with cheesecloth, and then used the cheesecloth to squeeze out all of the oil, leaving the bits of herbs behind. Because we weren’t convinced all the alcohol had been cooked out, we returned the oil to the crockpot until we could not smell any evaporating vodka. Finally it was time to add the beeswax. We used pelleted wax, and added wax in about a 1:5 ratio, where it was one part wax to 5 parts oil (less wax could be used, up to a 1:8 ratio, if the salve will remain cool; this was to allow it to remain solid in Texas heat). Once the wax melted, it was then time to pack it up. >We added a few drops of Vitamin E oil and Grapefruit seed extract to each container we were going to use for salve, and then poured the hot wax mixture into the tub. We labeled the containers and let them sit in the cool air to set up… and that’s it! Great blog and these classes are awesome! 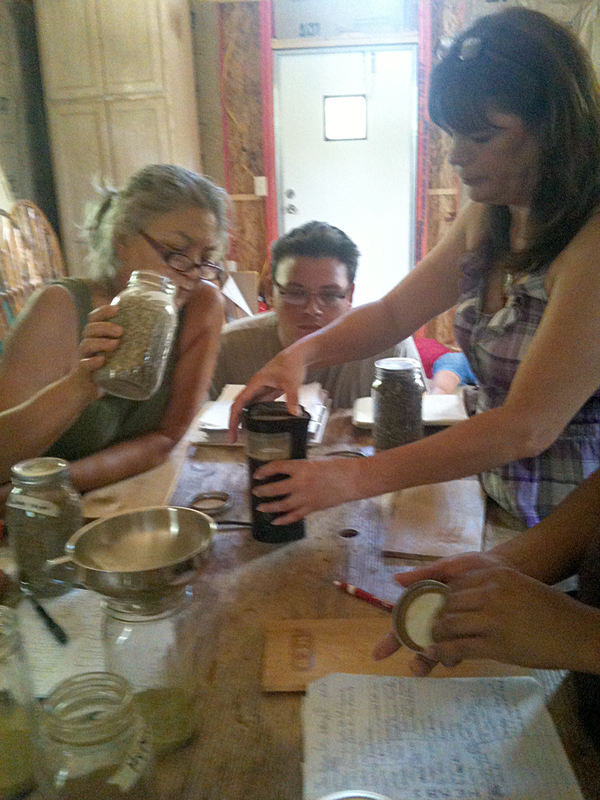 It is very empowering to create your own medicinals! Thanks Sam!